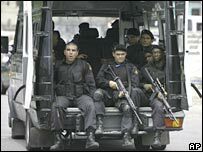 Human rights groups in Brazil have criticised the police for holding a 12-year-old girl in a police cell for six days. The girl was on her own, but she was kept next to cells which are used exclusively to hold male prisoners. She is accused of hitting the police officer in charge of the station when she was being questioned about running away with her 18-year-old boyfriend. She had been reported missing by her parents after leaving home. According to local media reports, the girl went to the police station, in the town of Sidrolandia in the state of Mato Grosso do Sul, to try and ensure that her boyfriend did not face any criminal charges. However, while she was being questioned by the local police chief, he tried to take away her mobile phone, and she is alleged to have hit him in the eye. The girl was arrested and placed in a police cell alongside others occupied exclusively by male prisoners. The cell, which can be monitored by a security camera 24 hours a day, has only a mattress and a bathroom without a door. Human rights activists in the state said the girl was frightened and distressed, and when taking a shower she was using inappropriate facilities without privacy. They accused the authorities of breaking laws designed to protect children and adolescents. This is not the first controversy involving the detention of young girls in adult facilities in Brazil. In the most notorious incident last year, a 15-year-old girl was held in the same cell as a group of male prisoners, where she was repeatedly sexually abused. Despite the enormous controversy that case generated, with 12 officials including police chiefs facing legal action, human rights activists says those responsible for ensuring the law is observed are still committing absurd abuses.